CSKA might have had their toughest season in recent years, but BEKO PBL Championship was the title they certainly didn't want to lose. The Army Men came from 1:0 down to get 3:1 series win over arch-rivals Khimki. 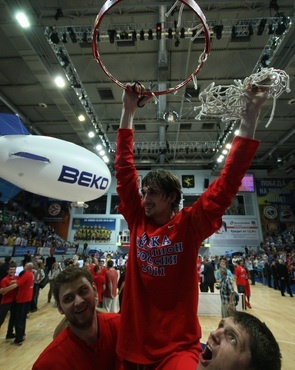 CSKA became the first ever BEKO PBL champions, wining their 9th straight Russian title. James Holden was CSKA's key player in Game 4 of the finals. The American veteran scored 25 points including a couple of 3pts in the clutch time. Holden shot 67 percent from behind the arc. Khimki did beat the champions on the board but that was perhaps their only success of the night. CSKA's head coach Jonas Kazlauskas made sure he was in control throughout the math and the home side didn't come closer then 5-point gap. A well-deserved title for the Army Men! Congratulations! League's finals standings after the end of all play-offs series.